ChemSee’s proven and validated Explosive Detection Kits offer a visual alternative to the false-positive prone electronic sniffers offered by other companies. 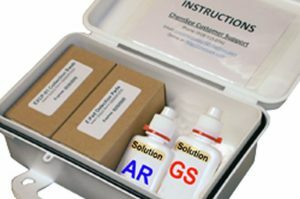 ChemSee’s Explosive Detection Kits offer a direct-read, instant test that is proven and verified. ChemSee’s EXPKIT-01 through 03 Detection Kits are portable kits for the detection explosives and explosive precursors. 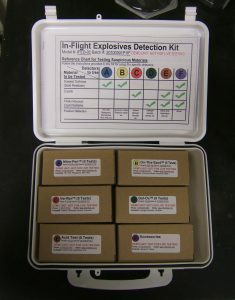 All Kits contain multiple detectors for specific types of explosives. Additionally, individual detectors can be purchased to refill the Kit after use. ChemSee’s Nitro-Screen Kit can be used to test 140 samples for the presence of explosive nitrates including TNT, Nitroglycerin, PETN, RDX, HMX and Ammonium Nitrate. ChemSee’s In-Flight Explosives Detection Kit offers simple, colorimetric detection of explosives. This Kit does not require the use of hazardous solvents or vapors which are hazardous especially in the confined space of an airplane cabin. ChemSee has available detectors for specific explosives. These detectors allow for specific analysis, even in a field setting. ChemSee’s 3A2Z Fertilizer Detection Kit is an easy-to-use, low-cost detector and identifier for fertilizers that can be used to make explosives. The analysis takes less than five minutes. This detector can easily detect and identify the following fertilizers in a SINGLE sample: Ammonium Nitrate, Urea Nitrate, Potassium Nitrate, Sodium Nitrate, Ammonium Sulfate, Urea and Explosion-Inert. Small & Lightweight: Easy to deploy and transport in the field. Simple to Use: Can be used by unskilled personnel in a field setting. Low-Cost: Can deploy multiple Kits at lower cost per test than competitors. Colorimetric Detection: Prevent false positives & negatives. All of the Test Materials Included: No need for additional equipment. Use Instructions Included: Simple tests that even a laymen can perform. Easy Transportation and Disposal: All materials in the kits can be transported and disposed of without restriction or certification. Instructional Videos Available: Users can be trained online.